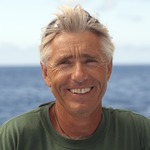 Glenn Edney is an Ocean ecologist, underwater naturalist, sailor and professional diver. He has been exploring the Ocean and interacting with Ocean life for more than 30 years. He has an MSc in Holistic Science from Schumacher College and Plymouth University UK. His research is focused on understanding the Ocean as a living system and the role she plays as the primary life support system for our planet. He has a strong interest in bringing together traditional indigenous Ocean knowledge and modern scientific ecological understanding. For the past four years he has been collaborating with OceansWatch.org in working with communities in Vanuatu and the Solomon Islands to develop community based, qualitative assessment methodologies to monitor the health of local reefs.